Senate Committee Delays Kavanaugh Vote Until 9/20 - Joe.My.God. 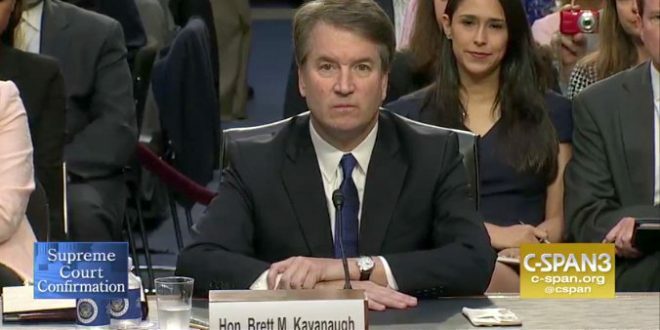 The Senate Judiciary Committee pushed a vote on the nomination of Brett Kavanaugh to the Supreme Court until next week, and decided to vote on his nomination for Sept. 20 at 1:45 p.m.
Senate Judiciary Committee Chairman Chuck Grassley, R-Iowa, started the meeting by announcing Kavanaugh’s nomination would be held for a week. After a few minutes of debate, the committee voted along party lines, 11-10, to set the committee’s vote for Sept. 20 at 1:45 p.m.
Senate Democrats tried to delay committee business in a last-bid ditch to stall the Supreme Court nominee, but Grassley seized control of the committee upon its opening and immediately moved to tee up a vote on Kavanaugh next week. Republicans also defeated a Democratic motion to subpoena Kavanaugh’s documents from his time working in the White House.